Are you looking for a CELTA centre in the US? Have you always dreamed of doing a TEFL qualification abroad? Look no further. The USA has a number of well-renowned CELTA centres throughout the country. 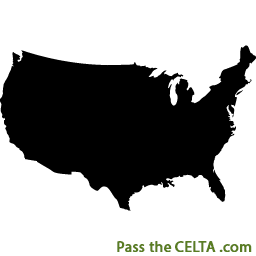 CELTA centres in the USA can be found from coast to coast from California to Florida. Depending on what you want, whether it’s the sunny shores of Miami or the glittery streets of Hollywood, there’s a USA location to suit everyone’s preferences. The USA is such a diverse country with plenty of interesting sights and adventure for those of you who are thrill-seekers, so make sure you leave a week or so at the end of your CELTA course in America to really make the most of it. Because there are constant updates and changes with CELTA changes be sure check the official Cambridge website.